Guitarist Adam Rogers continues his longtime association with alto saxophonist David Binney. Rogers is known for his fret work with Chris Potter and the late Michael Brecker. 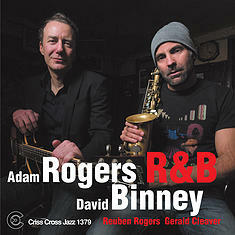 Rogers and Binney have chosen a collection of well-known standards as vehicals on their latest Criss Cross release entitled, R & B. The co-lead a lean and hard-swinging quartet with bassist Reuben Rogers (no relation) and drummer Gerald Cleaver. In a departure from their usual focus on original material, Rogers and Binney aim straight for bebop, ballads and classics by: Thelonious Monk, Freddie Hubbard and Wayne Shorter, Miles Davis, among others. The result is a fresh new sound for these well-known vehicles of improvisation. Rogers tone is unique and warm, his fretwork and musical color and range are intelligent and bring a new perspective to the guitaristic language when approaching standards. The re-working of the standard repertoire could have been a contented blowing date on cruise control. However, Rogers and Binney dig deep into each selection to find subtle twists of harmonic motion and colorful counterpoint, but no matter how far the boundaries are pushed, fragmented or colored, there remains an umbilical connection to the tradition of the jazz language. Great music with some fresh ideas on standard tunes. Absolutely worth getting, as is most of the music on the Criss Cross label.